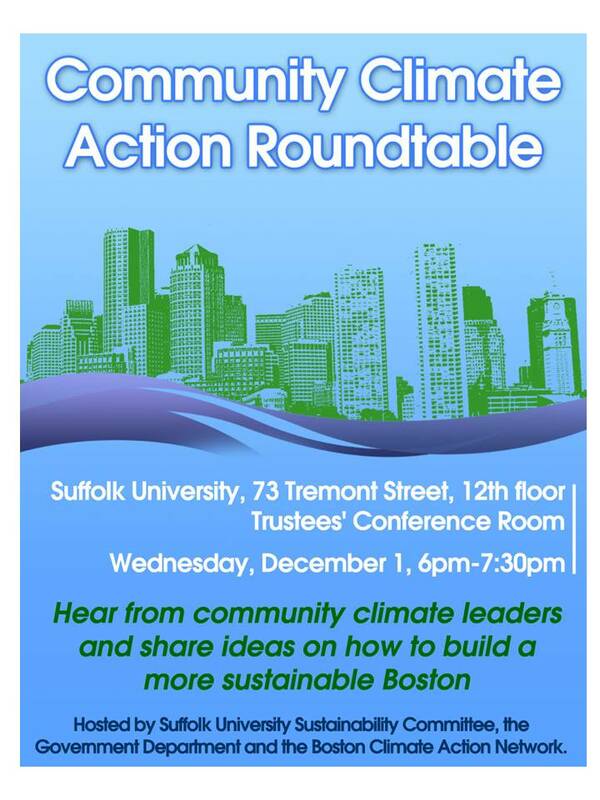 Join BostonCAN, Carl Spector, Executive Director of Boston’s Air Pollution Control Commission, and representatives from five of Boston’s many neighborhood sustainability organizations for a roundtable dialogue about community climate action in Boston. Come see a short video about how climate change is already affecting in Boston and our future vulnerabilities, and share your ideas for engaging more people in making Boston more sustainable. Panelists include Khalida Smalls from ACE, Rosanne Foley from Dorchester Environmental Health Coalition, Ray Porfilio from West Roxbury Saves Energy, and Stepanie Valovic of Planet Southie. Snacks provided. Free and open to the public. Hosted by Suffolk University Sustainability Committee, the Government Department, Human Resources, and the Boston Climate Action Network. Previous Article ‘Button Up Your Home for Winter’ this Friday, November 12th! Next Article Make a Green New Year’s Resolution!